Sign up for my short monthly newsletter on creativity, tech and learning (see the form below) and immediately receive a free copy of 31 Days of Teaching Like an Artist! This free digital journal is an inspiring resource for teachers. It's great for personal development, but it can also be a powerful tool for PLCs, edcamps and other PD activities. It's the result of my 22 years in education, learning and helping others learn through the power of good questions. I'm thrilled to share it with as many educators as possible! Connect your work to your passions. See exciting possibilities for you and your students. 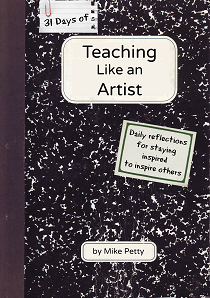 To get a free copy of 31 Days of Teaching Like an Artist, just subscribe to my monthly newsletter by providing an email address in the form below. At the start of each month, I send a short message by email with the best tips, links and other resources that I create or discover. If you don't find the newsletter useful, you can easily unsubscribe at any time. Please enter your email address to subscribe to my newsletter and to receive a link by email to a free copy of 31 Days of Teaching Like an Artist.